Aparecida and Guaratinguetá are two small cities on the mainline railroad – or on the Via Dutra highway – about half-way between São Paulo and Rio de Janeiro [see area map]. [By rail, Aparecida is 200 km east of São Paulo and 5 km west of Guaratinguetá; the latter is 300 km west of Rio.] 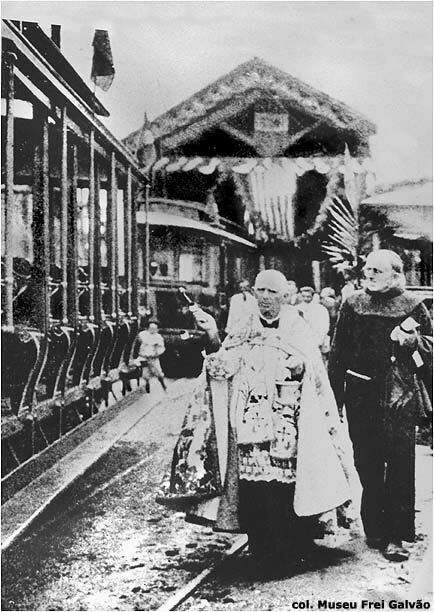 Aparecida was originally a distrito in the municipality of Guaratinguetá – whence the name of the tramway company, which was actually headquartered in Aparecida [see pictures below]. 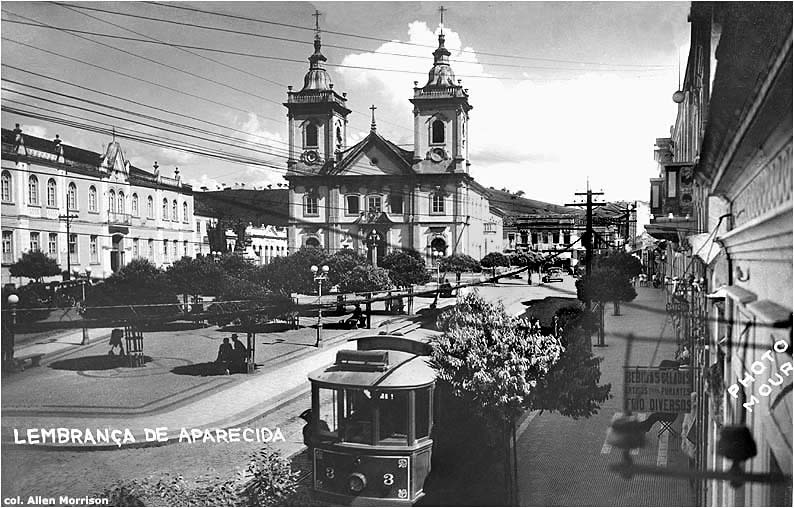 The separate municipality of Aparecida was formed in 1928. Nossa Senhora Aparecida is Brazil's patron saint and the cathedral on top of the hill in Aparecida is the chief place of pilgrimage for Roman Catholics in Brazil. A large new basilica nearby was dedicated by Pope John Paul II during his visit in 1980 [see city map]. 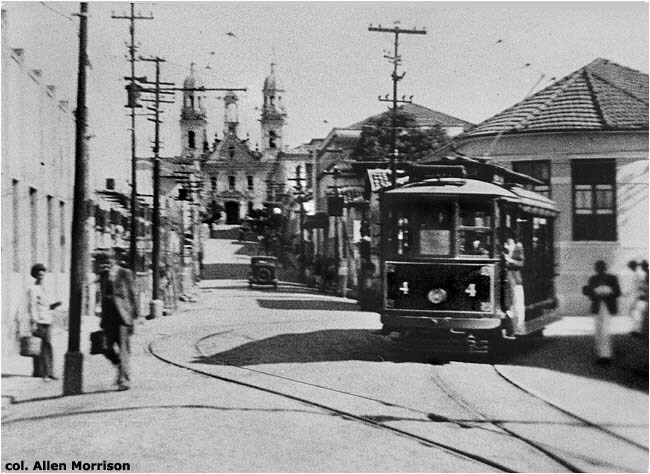 To reach the hilltop shrine a tramway was built between the Aparecida railroad station and the church in 1895. Equipment was acquired second-hand from Niterói and two, sometimes three, mules were required to pull a car up the steep grade on Rua Oliveira Braga. 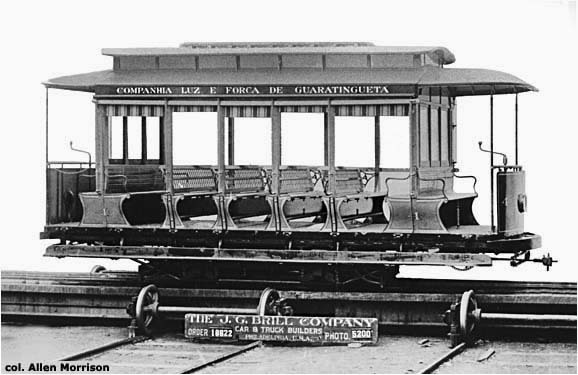 In the county seat of Guaratinguetá, 5 km northeast, the Ferro-Carril de Guaratinguetá inaugurated another mule tramway on Christmas Day 1898. 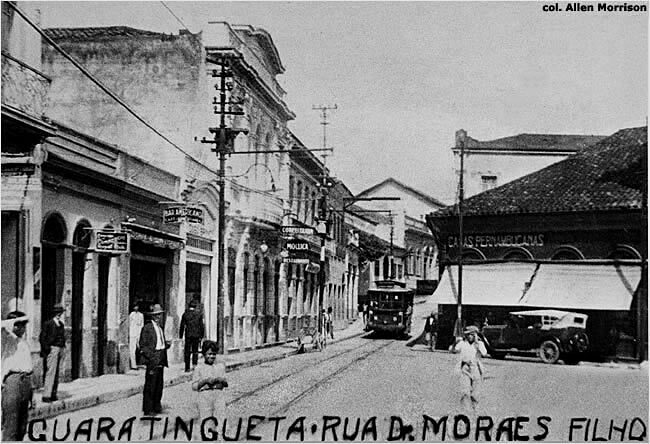 This line began at Praça Conselheiro Rodrigues Alves in Guaratinguetá and ran north across the Paraíba do Sul River to Pedregulho [see map]. 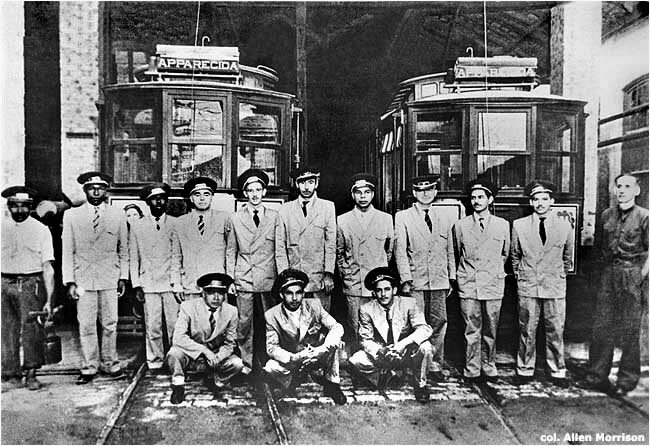 A local bus operator, Jacobelli & Companhia, acquired the line in March 1951 and closed the tramway about 1957. The precise date of closure could not be found. The abandoned depot, on the private right-of-way section in Aparecida, which has since been converted into Avenida Zezé Valadão, was still visible in the 1980s from the Via Dutra highway [see map]. "Open Cars for Guaratinguetá, Brazil." Brill Magazine (Philadelphia), 7/1912, pp. 223-224. Brief description of Brill equipment. Builder's photo. Brasil. Instituto Brasileiro de Geografia e Estatística. 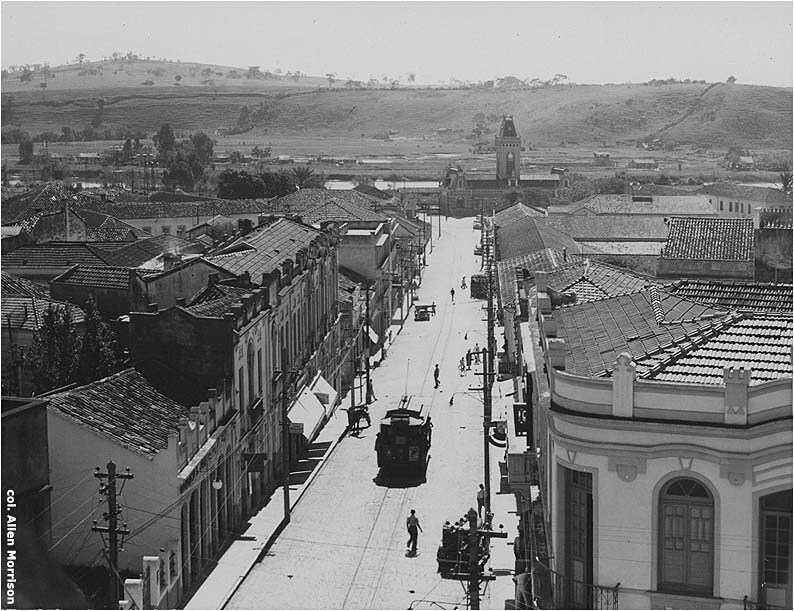 Anuário Estatístico do Brasil, 1912-59. RJ, 1917-59. (Issued by Ministério da Agricultura, Indústria e Commércio, 1917; Instituto Nacional de Estatística, 1930-7.) Tramway statistics for Brazilian cities, including Guaratinguetá. São Paulo (state). Repartição de Estatística. Annuario Estatístico de São Paulo, 1913-21. SP, 1915-26. "Viação Urbana" section in vol. 2 each year provides tramway data for systems in São Paulo state. 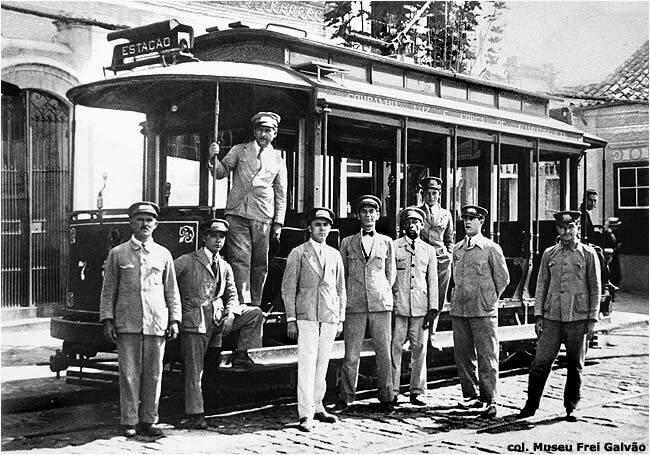 Untitled news item in Brazil-Ferro-Carril (Rio de Janeiro), 30/9/1913, p. 430. Tramway construction. Vasconcelos, Max de. Vias Brasileiras de Comunicação. 5th ed., Rio de Janeiro, 1934. Foldout street maps show electric tramways in both Aparecida and Guaratinguetá. Athayde, Capitão. Aparecida no Bolso: Guia da Cidade de Aparecida. Aparecida, 1953. Tram itinerary, pp. 31-32. Pasin, José Luiz. Guaratinguetá, tempo e memória. São Paulo, 1983. 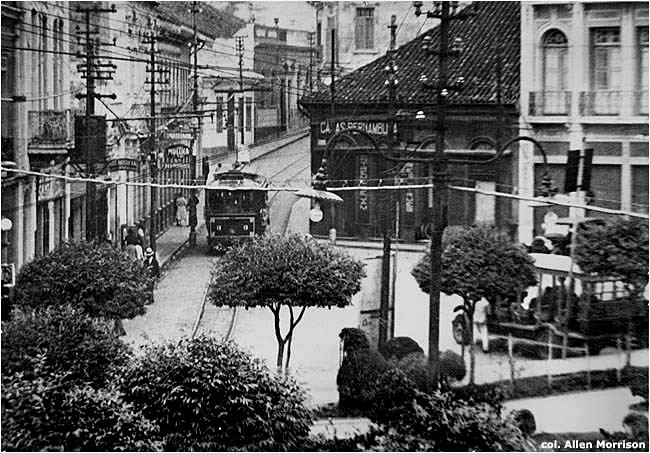 Nice big picture of two trams on Rua Dr. Martiniano, p. 85. Brief mention of a "linha de bondes", p. 87. Coupé, Benedito Bubsky. "Relembrando os Bondinhos" in Correio Cultura (Guaratinguetá), 3/1984, p. 8. 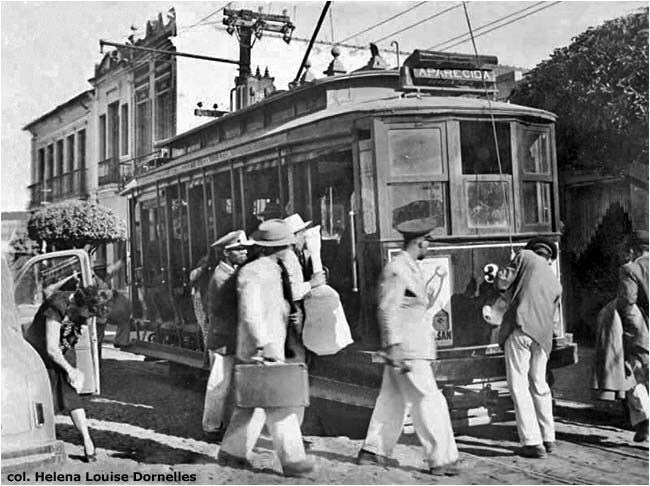 Tramway history.